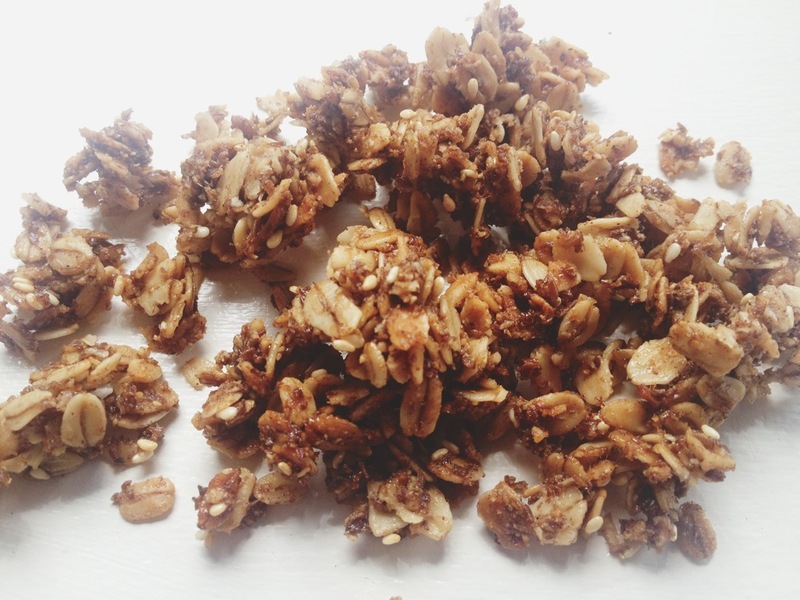 Friends, I’ve been working on perfecting my granola recipe for some time now. I just hadn’t quite reached that satisfactorily, perfected balance of crispy, soft, crunchy, sweet, nutty granola. Until yesterday. And I tell ya what, I think I hit the nail on the head. I’m gonna lay it all out for ya. By the way, this is a fairly small batch. Double the recipe to make enough to last for a few days:) It goes quick around here! Optional: Add 1/4 cup chopped PECANS and/or 2 TBSP SESAME SEEDS before baking. Mix the dry’s. Mix the wet’s. Then all together. Oven at 350. Bake 12 min. STIR. Bake 12 min more. After it cools on foil, add 1/4 cup DRIED CRANBERRIES. Sounds good! Since 2 of the Mongolds are gluten free, I’d like to make my own granola as the gf store bought stuff is expensive!! I made your granola last night. My brother & sister in law just had a baby and I’m bringing your granola for a yummy, quick breakfast for these sweet, new parents. Thanks for sharing! Carrie that’s wonderful, & very sweet of you!